I really like the BMW R12 Motorbike made by the German during WW2 and really obsess to ride it if I had a chance soon. 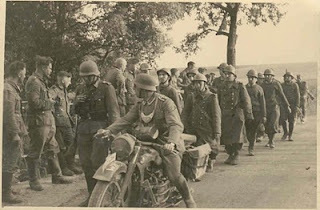 The bike was similar with the British Model 1940 Norton 16H also used during WW2 which apparently one of my father collection. Since the part of the 1940 Norton 16H already extinct, the motorbike was placed at our backyard garage but don't worry it was covered with plastic warping and safe from rust. My intention to store it was to get a high bid from my relative who are really want to buy it. My farther serve with the Royal Malaysian Force, 2nd Regiment 2nd Batalion ( 1965-1978) and bought it from a backyard of a British Officer somewhere in Perak in 1966. My Father call it " Crayam" and after all this year I still do not understand it at all why he call it "Crayam". 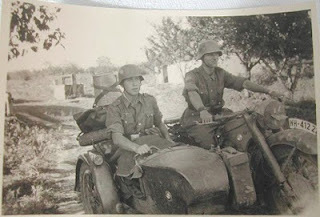 The above picture is not my father motorbike. Later I will show you all the motorbike. 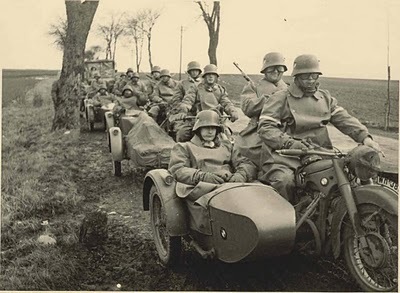 Picture of the BMW R12 motorcycle made in 1938 that is destined for the Army (Heer). 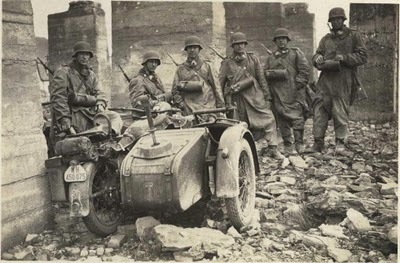 The German soldiers take pictures with the BMW R12 motorcycle in the middle of the ruins. Storage tin gas mask hanging on the chest of each. Apparently they've had an exhausting day! Take pictures for a moment in the middle of a long journey. 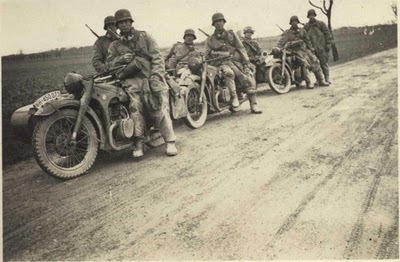 Their rain jackets have been filled with dust, nor were the face and the BMW R12 motorcycle tandem of them! 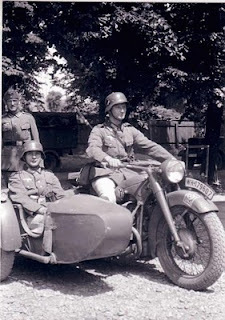 Two Wehrmacht soldiers in style with the BMW R12 motorcycle tandem them. It seems that this bike is still brand new, visible from the front tires are still smooth and not bald! 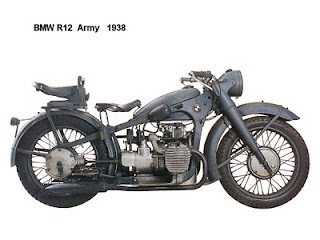 Automotive company BMW first introduced the R12 series motorcycle in 1935, and is the world's first motorcycle equipped by telescopic hydraulic dampers trifurcate. With a 745-cc engine and weighing 408 lbs, the BMW-powered R12 20 horsepower at 3400rpm and can reach a maximum speed of 75 miles / hour. 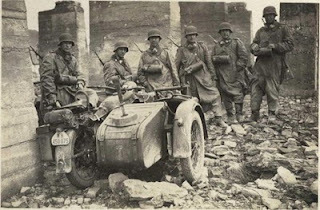 BMW BMW-R12 is the most popular type used by the Wehrmacht, although the R35, R71 and R75 were pretty popular and have appeared in photographs of that era. Engine oil, gearbox and axle - SAE 40 (summer), changed every 2000 km, while the oil filter should be replaced every 12,000 km.